April 21, 2018 By Lori Leave a Comment THIS POST MAY CONTAIN AFFILIATE LINKS. PLEASE READ MY DISCLOSURE HERE. This is the sauce that my kids have been known to drink from the bottom of the bowl. Use with gnocchi, a filled pasta or a classic spaghetti. Adapted from the queen of Italian cuisine, Marcella Hazan’s The Essentials of Italian Cooking. 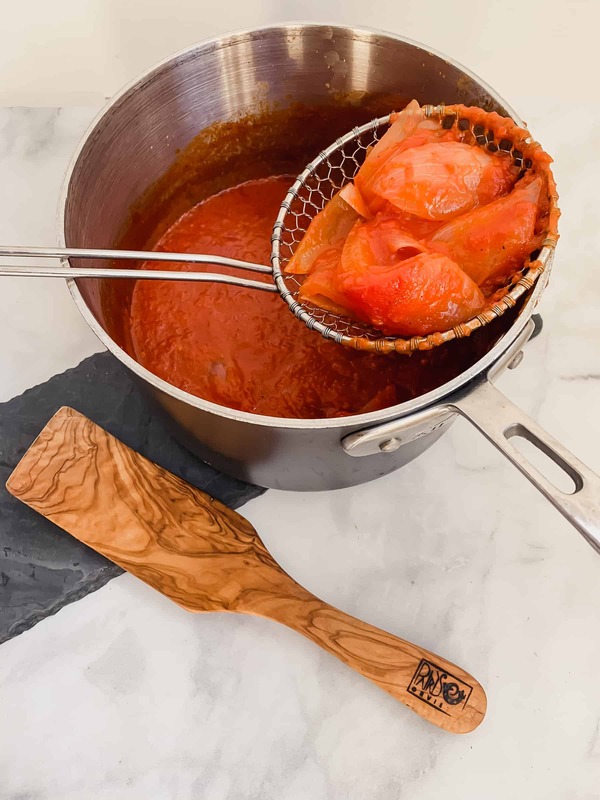 Homemade spaghetti sauce doesn’t have to cook all day when 45 minutes is all that’s needed. I found this sauce when I was thumbing through my favorite Italian cookbook which, by the way, probably should be an oxymoron because my grandmas cooked like they never looked at a recipe. 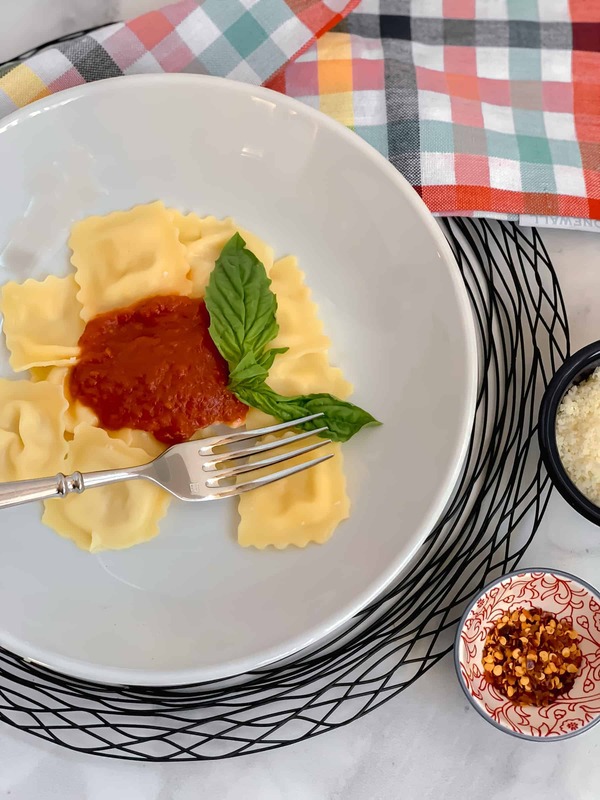 Whether it was homemade gnocchi or braciole, I always knew I was in for something special when I walked in the front door of either of their houses. The memories are mouth watering. If I could be half the grandma they each were, I’d feel like I won the lottery. On to the recipe! 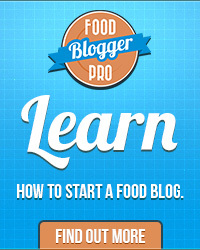 Purchase your favorite canned tomato if you aren’t using fresh – more on that here. A little advice: always go for the best you can afford. The proof will be in the sauce. Open said can of tomato into a medium saucepan and to that add some onion and some butter. That’s it. Seriously. That’s it. Using a slotted spoon or strainer, separate the cooked onions from the sauce. This is the part I like the best (next to the eating, of course). I have quadrupled this with no problem and you might have to if you’re serving 10. Blend tomatoes in blender to desired consistency. I prefer my sauce smoother. You certainly can leave them whole and crush them right in the pan with the back of a wooden spoon. Peel onion, cut in half, trim shaggy roots and add to the pan. Add the butter a little salt and pepper (about 1 tsp of salt and maybe 1/2 tsp of pepper to start). 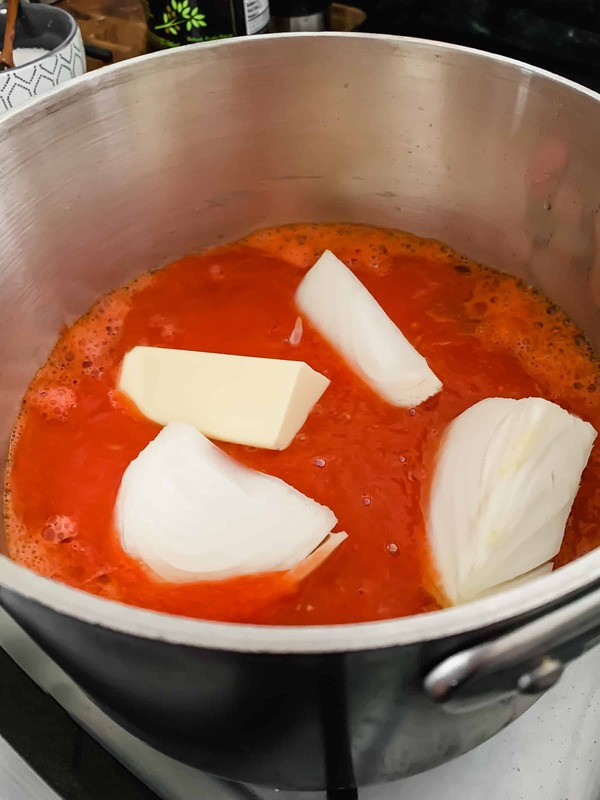 Simmer for 45 minutes uncovered until the fat starts to separate from the tomatoes. Adjust seasonings with salt and pepper. Of course, you can add red pepper too! So versatile. Add crushed red pepper, fresh basil but keep it simple.